Eid Mubarak to all my friends and readers! The holy month of Ramadan has bidden adieu and it is time for celebrations. Eid-ul-Fitr is the time where we share pleasantries, sweets and happiness with family, friends and neighbours and also remember Allah and thank Him for everything He has bestowed upon us. We usually prepare several sweets for Eid to serve guests visiting our home. Muthanjan, Carrot Halwa, Gulab Jamun and Sheer Khurma are commonly prepared at home for Eid. This time, I made vegetarian pannacotta without gelatin using agar agar as a dessert for dinner. The method of preparing and setting this pannacotta is similar to Falooda that I have shared earlier, but it is more flavourful and delicious and it is the strawberry puree that adds the much needed sweetness and taste to the pannacotta. Do try out this recipe and I am sure you will be impressed with its fabulous taste. Wash and soak the china grass in water for about 10 minutes. Then drain the excess water and grind the china grass to a fine paste. Remove the leaves from the strawberries and grind the strawberries along with 2 tbsp sugar to a fine puree. Do not add water. You can add more or less sugar depending on the sweetness of the strawberries. Transfer the strawberry puree to a small container and refrigerate till you are ready to serve. Boil milk in a pan and bring to a boil, reduce the heat and cook for about 10 minutes in low flame. Meanwhile cook the china grass with 1 cup of water in another pan till it completely dissolves. Then add sugar to this and cook for a couple of minutes. Remove the agar agar mix from flame and add milk and condensed milk. Mix well and check for taste. Add more sugar if necessary and give a quick mix. Pour the milk-agar agar mix into small muffin moulds or any bowls or cups of your choice. Allow it to cool down completely. The liquid will solidify on reaching the room temperature. Refrigerate for at least 3 to 4 hours and de-mould the pannacotta on small plates. 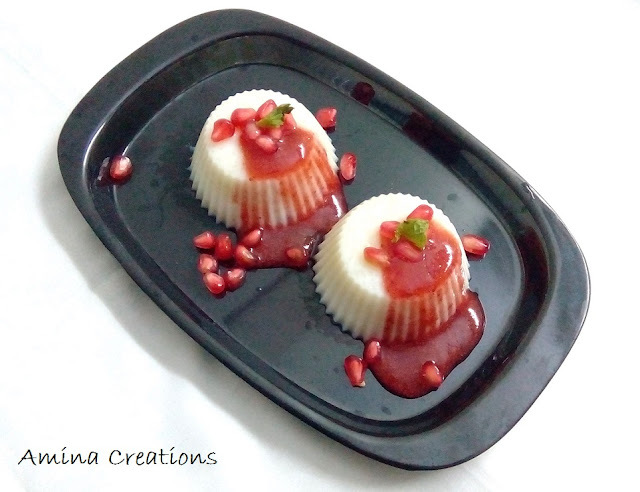 Pour the strawberry puree on top and garnish with mint leaves and pomegranate seeds. 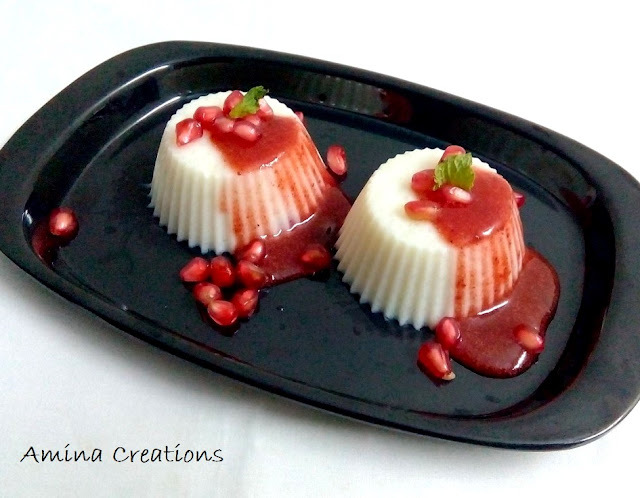 Your vegetarian pannacotta with ingredients available in every Indian home is ready to be served. For more Eid special sweet recipes check out this page.